Interestingly even in the Amazon UK top 10 ' vegan cookbook ' charts the list is mainly American recipe books from the USA. 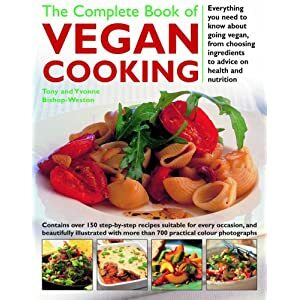 The Complete Book of Vegan Cooking a UK vegan diet recipe book doesn't make it in until number 6 although the same authors, Tony (cook) and Yvonne (nutritionist) Bishop-Weston have another vegan cookbook, The Vegan Cookbook, that currently sneaks in at number 10 despite being out of print. Tony Bishop-Weston's original legendary hardback Scottish Vegan cookbook, Rainbows and Wellies from over 15 years ago in 1995 , can still be picked up for around £15 on Amazon. Many of the vegan diet books in the vegan top ten are dedicated to vegan baking recipes as it seems vegans are obsessed with cup cakes and it's spuriously perceived that cakes are the hardest to create. In fact, as the British Complete Book of Vegan Cooking reveals, vegan cakes and baking is as easy as just leaving out the eggs and adding in a bit of soya milk or rice milk. As long as you have a good balance of protein, fat and sugar and something to emulsify the mix such as cocoa, lemon, vinegar or coffee it's hard to go wrong. New kid on the block in the UK is Yotam Ottolenghi who wrote a vegetarian series in the Observer - not even a vegetarian let a lone a vegan no -one is more surprised than he - Ottolenghi's books have fantastic photography that only The Complete Book of Vegan Cooking comes anything close to - it's clear he loves real food and has an appreciation of vegetables but if it's a vegan chocolate cake or lemon vegan cupcake you are looking for you are going to be sadly disappointed. Due to her feature on The Oprah Winfrey Show Kathy Freston's book the Veganist has made it into the Amazon bestsellers list, an amazing achievement for a vegan cookbook, but if the guidance on Oprah's website is anything to go by it's more of a 'menu out of a packet' book than a vegan recipe book - I guess that's what most people want. Quick and easy instant vegan meals rather than true recipes and actual cooking. None-the-less a vegan cookbook in the current Amazon bestsellers list is an amazing achievement, metered only by the fact that Donald Rumsfield book is at Number 1, so what does that say?